Fall is a stepping-down time of year. I always picture it as a spiral staircase, twisting, matching the flight of leaves twirling down and down. I never think of just moving from summer through fall in to winter, it's always a descent for me. Out of daylight into the darkness of winter evenings, from the warmth of the sun to the places where warmth comes in layers. Each year I willingly walk the path, and even while I am letting go of summer, stepping down into this chilly dark, I am in awe of the beauty of the descent. The other day I looked out my office window and the sky was a pale shade of gray. But there, just in front of it were the most beautiful crimson leaves. Red leaves on a pale gray sky -- it could have been a painting. It probably should have been. My grandfather could have done it justice, but I did not inherit his skill. Transitions are tricky things. Rosamunde Pilcher wrote that the trouble with transitions is that you can feel the edges of two worlds bumping up against each other. I think she's right. In either world, the world feels infinite, but in the transition you feel where things end and where they begin and that cane be scary. A friend of mine compares is to stepping into a boat. Even when you know the vessel is sea-worthy, stepping into causes movement and that little sway ripples doubt through an otherwise steady spirit. It was particularly satisfying to have an idea work out just exactly the way I hoped it would. I thought the leaves might work out and they did. The candy corn were Kendra's idea -- a brilliant one -- and we didn't let a lack of cookie cutter get in the way. Why did it never occur to me that you can just cut shapes out by hand? New and interesting cookies may be on the horizon. It is time to go back to the water, I can feel it. It's been a couple of weeks which is far too long. I need to finish the mediocre book I'm languishing in (or give up on it entirely), find something truly delicious to take its place and head for open water to commune. All I need is a hot coffee and warm blanket. I won't miss the sun. More than a year ago Amanda decided that when it was time for her grad trip she wanted to go back to Disneyland. And, being the wise young woman she is -- she's graduated now you know, she gets to make her own choices -- she invited us Aunties along. Never say no to southern California and Disneyland, especially when the company is as fine as this. Gord, Shannon, Amanda, Nicole, Tracy, Chrisaleen, Kendra and I headed south for some fun in the sun and boy did we ever. To me, So Cal will always be blue skies and palm trees. I don't know why I love the palm trees so much, but every time I come to California, they make me smile. The weather was just over a hundred degrees the whole time we were there and the skies were so clear and blue it was like God filled them in with a Crayola crayon. I am convinced that the sunshine is sunnier in California. You cannot convince me otherwise. Disneyland, as you know, is the happiest place on earth. I wonder if they put magical herbs in the air because people really do seem to be in a good mood. (Except for the occasional screaming child star-fished on the pavement, but we won't speak of that.) 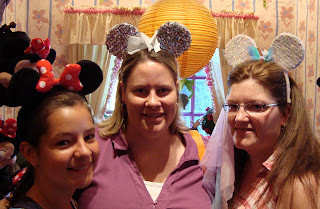 Even grown-up feel the need to put on silly mouse ears and pose for pictures. Kendra ended up buying the sparkly ones I'm wearing and I might, possibly have borrowed them while she was off riding California Screaming ie the scariest looking coaster of ALL TIME. In addition to ears there is a general cuteness pretty much everywhere you look. As evidence, I give you People's Exhibit A. COME ON, it's a candy apple shaped like Micky Mouse?! You can't make this stuff up. It was delicious - layers of caramel and chocolate and crazy red sugar-sprinkles that got absolutely everywhere. Fortunately, I wasn't planning to impress anyone on this trip anyway. The mess was so completely worth it.